With Brandon Belt on second and Buster Posey on first the line drive off of Hunter Pence’s bat hung in the air. The crowd groaned in anticipation of watching Belt cross the plate tying the game at six, but the line drive hung in the air. Denard Span may not have been the offensive lead-off hitter the Nats wanted, but he has been the defensive outfielder they’ve needed and on several occasions he has saved his pitching staff. The line drive hung in the air, the crowd groaned, and then they cheered as Span out ran the baseball and made a rare diving catch. The Nats 18-16 record in one run games would lead one to believe they were good in close games or at least not bad. Doing what winning teams do as the narrative squad would have you know. It isn’t the case. This evening’s contest is a drama that has played out far too often for the Washington Nationals. After a solo homer in the second inning tied the game the Nationals exploded in the fourth inning sending ten batters to the plate and scoring five runs to take what appeared to be a commanding 6-1 lead, or so it appeared. As has happened far too often when the Nats get a lead of this magnitude they are unable to hold it, or at least unable to keep it a commanding lead. The issue may be the bullpen, but it is hard to say when the manager is consistently putting the wrong relievers into situations. Davey Johnson is a manager who gives his players every opportunity to fail and more often than not this season they have. In July when Drew Storen had an over 10.00 ERA he was the Nats second most reliever. Ryan Mattheus hasn’t been good since returning off the DL but Davey Johnson keeps throwing him out there. With a five run lead to start the eighth Davey Johnson went to Ian Krol, and after a long homerun by Brandon Belt, a fine young player, Johnson had seen enough and lifted the lefty Krol to bring in the righty Mattheus to face the righties Posey and Pence. It was a strange moment. This wasn’t a tight game and not the time to play match-ups. Krol has better stuff than Mattheus and despite being left handed has shown an ability to get both right handers and left handers out. 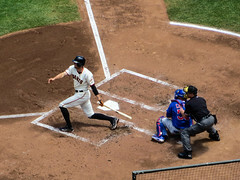 Instead of giving Krol the opportunity to try Davey Johnson brought in Ryan Mattheus, a struggling pitcher, and it allowed the Giants to pull within two as Posey and Pence would come around to score on Sandoval’s double. Clippard when then come in to clean up the mess striking out the only two batters he faced. Now a save situation Soriano came in to pitch the ninth and before it was over it would be a one run game and if Span wasn’t on the team it might not have been a win. Soriano started the inning giving up a single to Hector Sanchez before getting Scutaro to fly out to Harper and Crawford to ground out to Desmond. Brandon Belt would single to pull the Giants within one and Posey would follow it up with a single of his own to keep the Giants hopes alive. With the tying run on second and running on contact Pence stroked a line drive to the left center gap. It hung in the air and the crowd groaned in anticipation of a tie game, but the ball hung in the air for a moment too long, and Denard Span was able to run it down.